We were in John Leigh Park on Sunday 4th June for their Centenary Celebration, and what a great afternoon we had! 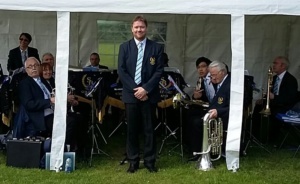 Ably led by MD Simon Robertshaw the band played a variety of music including ranging from formal marches Imperial Echoes and Standard of St George to Beatles and Disney favourites, all of which were well received by the crowd. The weather was wonderful, not even a gust of wind to blow our music off the stands. We hope this will be the first of many visits to this lovely park. Here are a couple of photos – there are more on the Facebook page if you want to have a look. with Simon Robertshaw, our MD. Celebrating our return to Stretford. Tickets are now on sale for our next concert – please come and support us and listen to an amazing local band playing for an amazing local community! Well, we are now firmly ensconced in our new home at Sevenways Methodist Church in STRETFORD! The move came at the beginning of February and thanks to our willing members and families was accomplished smoothly. 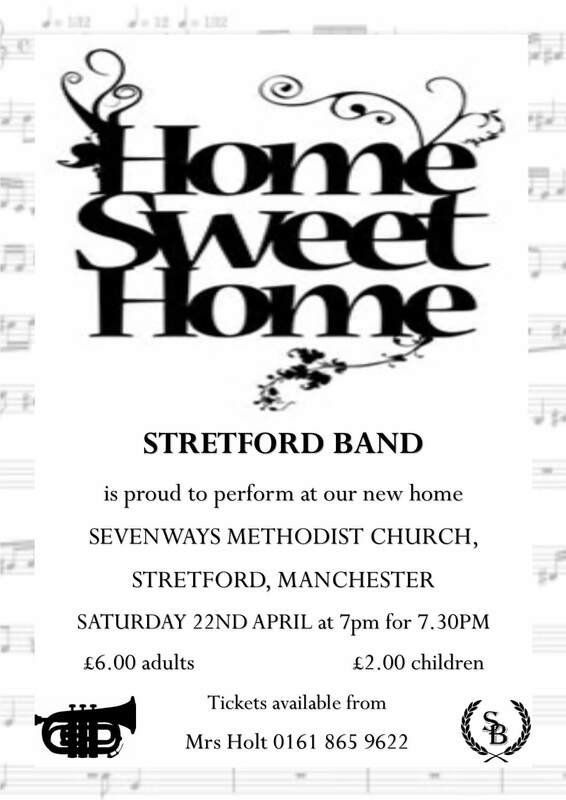 We are spending our time now preparing for our concert on April 22nd which we have called “Home Sweet Home” and tickets for this will go on sale very shortly. Of course, we are delighted to be back on home ground after so many years in Sale, and we are looking forward to making connections locally. We will look forward to seeing you in April then. And don’t forget, if you play a trombone or any other brass instrument and would like to come along and give us a try, get in touch and come along to one of our rehearsals. We are a friendly bunch and are happy to welcome new faces! Our players range in age from 20(ish) to over 70 so we are a real community band. It’s part of what makes us interesting. Well, it was a busy season for us as usual, but this year the band focussed on Christmas concerts rather than general carolling, and we all had a good time. Our performances are listed below and were very well received. 3rd December – Victoria park – carolling – well we couldn’t miss this one, could we? and with the local school singing their hearts out we were glad to add to the mix. A great time. 10th December – our first formal concert of Christmas was at Christ Church in Davyhulme. We were glad to return to this lovely church and had a warm welcome! 11th December – Parkers Garden Centre in Flixton. A new venue for us and a generally uplifting carolling session. We were joined by our junior conductor Evie who borrowed her two batons from Ian and proceeded to make the rep player flinch by vigorous flourishing of both batons. But she’s only little, and she certainly added to the fun. We had a few little conductors that day, which we love, and the parents were enjoying it too. 15th December – well into the swing of things by now, and we were playing carols at the Good Bag Company around their Christmas tree outside the shop. That’s always an enjoyable job, mulled wine and mince pies included. 17th December – All Saints Church, Stretford – another formal concert at one of our regular venues. It was great to be back and we gave full value! The band sounded great. 18th December – Christian Life Centre, Stretford – this was a Christmas service with hymns and a concert to follow. The centre was full and the reception enthusiastic! 22nd December – Railway pub Stockport – our Christmas social with added carols. ‘Nuf said. 29th December – back at the Good Bag Company for their Christmas do and playing outside around the tree again. Our deputy conductor Tracey stood in and did a fine job, much appreciated by the locals. And we finished up in the pub as all good bands do! October – possibly two concerts, one joint with another band and the other not. Other – Victoria Park – at intervals through the year. No doubt there will be other things that come up over the year, and a full Christmas season as usual. We are always glad to receive enquiries for performances – please contact our band manager if you want to discuss options! 2017 is going to be a wonderful year for Stretford Band! Although we were sad to see Ian Mitchell leave, we are delighted to be working with Simon Robertshaw from January – but that isn’t all that’s changing! In a move instantly dubbed “Strexit” by our resident wit, the announcement has been made that the band will be leaving our long-time home at Sale Sports Club and moving to Sevenways Methodist church in Stretford. We have been based in Sale for a very long time (see band history) and have been looking at ways to return to Stretford for a while. Sale Sports club is also planning redevelopment which would have meant either changing out rehearsal night or dropping to one rehearsal a week rather than two; neither of which options was ideal for us. 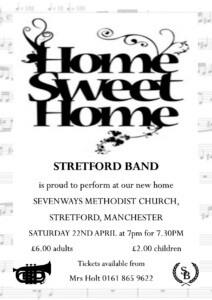 With our developing relationship with Sevenways Methodist church we have found a band home and a community back on home territory in Stretford, and a great rehearsal and concert venue which we think will benefit all concerned. Although the actual date isn’t fixed yet (anyone up for moving the library? ), we expect to be rehearsing there from the end of January 2017. Why not come and see us? A warm welcome to our new Musical Director Simon Robertshaw who takes up his position from January 2017. Simon comes to us with a wealth of experience in different musical fields, including a 14 year stint on violin at the BBC Philharmonic, and bass for metal band Vice (that’s bass guitar!). He’s keen to develop his conducting skills further and is undertaking CPD conducting studies at the RNCM. Simon has also trained as a BBC cameraman and has filmed around the world for the BBC. 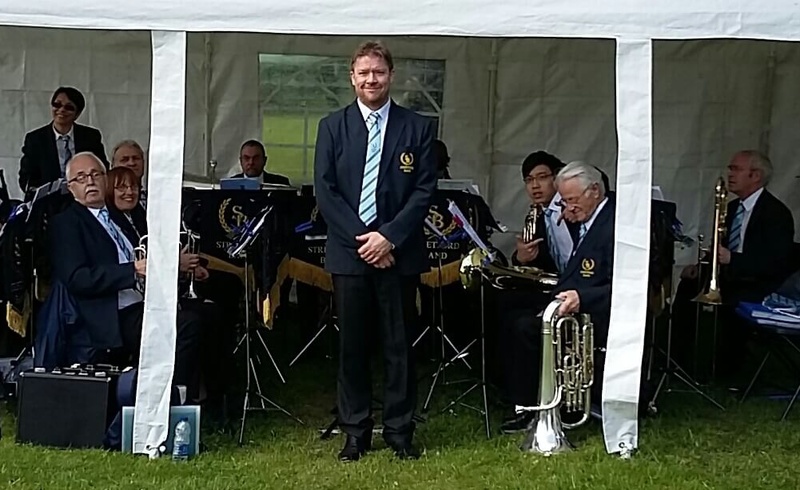 Stretford Band is delighted to welcome Simon to the ranks and are looking forward to continuing to develop our new fresh sound, work that started under Ian Mitchell who left the band after Christmas for a role in Oman. We wish Ian the best of luck and offer him sincere thanks for revitalising our music. Stretford Band were proud to play at Sevenways Methodist Church for a Remembrance concert on 12th November 2016. We were delighted to be able to send nearly £400 to the British Legion as a result. Thanks are due also to the ladies from the Milton Lodge Care Home in Fleetwood who spent time in advance knitting poppies for sale, which boosted those funds (and to Amelia who organised the sale). We look forward to a long association with Sevenways Methodist Church. We are happy to announce that Jack Price joined the band on Soprano. Welcome, Jack! This was our official Remembrance concert at Sevenways and it went extremely well. One of the highlights of this was the Evening Hymn and Last Post, composed by our Musical Director Ian Mitchell and played beautifully by the band and our guest Catherine who played the famous Last Post itself. A moving and uplifting arrangement which finished the concert with a standing ovation. Our thanks to Sevenways for hosting us, and for all the ladies who knitted the beautiful poppies we all wore! Donations will be made to the Poppy Appeal and the British Legion. Well done to James McFadyen who used to play soprano with us before he moved! It's a great pleasure for us to be able to announce that after a fantastic turnout for our inaugural composition competition, the following 7 composers and compositions have made it through to a final round - which will be assessed in partnership with ourselves by international Euphonium soloist David Thornton, and renowned composer David Horne. (in order of photos, top left - bottom right). Final results and prizes will be announced in the next few weeks! Congratulations! Well done to all our many band friends who competed at Blackpool today. Sounds like you all had a good time and did well. Special well done to Sale Brass! Sorry folks, for the delay in making those changes to the website. I haven't forgotten!